The world-class National Museum of the Pacific War recalls the conflicts vast sweep. The small (population 12,000), central-Texas town of Fredericksburg, about an hour’s drive west of Austin and a little more than that northwest of San Antonio, may seem an odd location for the National Museum of the Pacific War until one realizes that Fredericksburg is the hometown of Fleet Admiral Chester Nimitz––the Eisenhower of the Pacific Theater. This Australian M-3 Stuart tank was knocked out by a Japanese gun during the battle for the Kokoda Track on New Guinea, May 1942. A video interview with the surviving tank commander adds the human element to the display. And while it may seem a bit off the beaten path and a long way to drive, the NMPW is worth every mile. 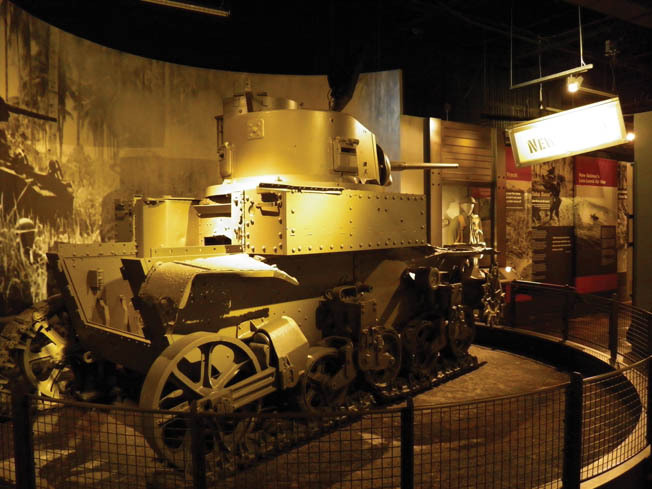 In fact, the museum is the equal of the world’s other great military museums: the National Infantry Museum at Fort Benning; the Air Force Museum at Wright-Patterson (Dayton); the Marine Corps Museum at Quantico, Virginia; the 1st Infantry Division Museum in Wheaton, Illinois; the Imperial War Museum in London; the World War I Museum in Kansas City, etc. 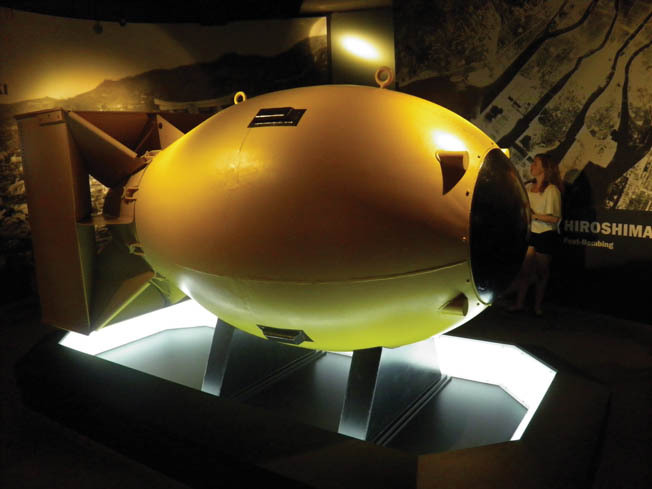 A full-size replica of “Fat Man”—the atomic bomb dropped by the B-29 Bock’s Car over Nagasaki on August 9, 1945. Dramatic lighting, music, sound effects, and strikingly designed exhibits guide the visitor through the sometimes-complex Pacific campaign in an easy-to-follow, chronologically arranged trail. The museum is jam-packed with important artifacts, such as one of the Japanese mini-submarines raised from the waters at Pearl Harbor; a rusty hatch recovered from the sunken USS Arizona; a number of U.S. and Japanese aircraft, including a B-25 of the type that Jimmy Doolittle’s squadron used in the 1942 raid on Tokyo; a damaged Aussie Stuart tank and, nearby, the very Japanese gun that knocked it out on Buna; and much more. 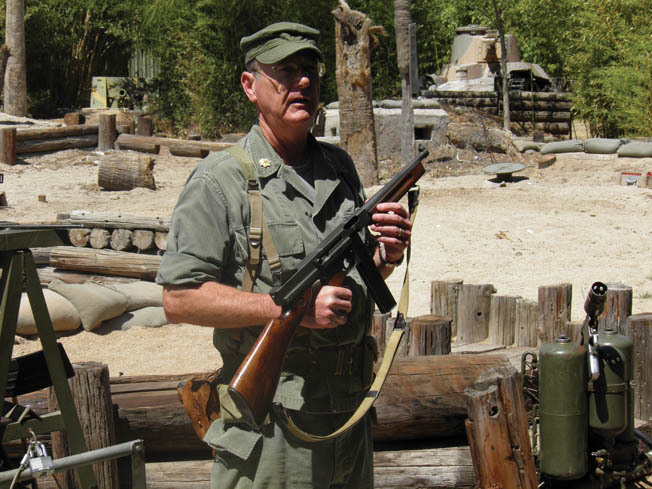 Richard Koone, education director of the museum, gives a weapons demonstration in front of the realistic “Tarawa” battlefield at the Pacific Combat Zone. In addition to the displays at the main facility, the museum also has an annex—the Pacific Combat Zone—located three blocks east. The annex, which requires a guide to visit (available for free at the main museum), houses the last existing PT boat (PT-309) to see combat, a TBM Avenger, and a realistic outdoor amphitheater where reenactors representing Japanese troops and U.S. Marines do battle for the public on certain weekends of the year; check the museum’s website for dates and times. 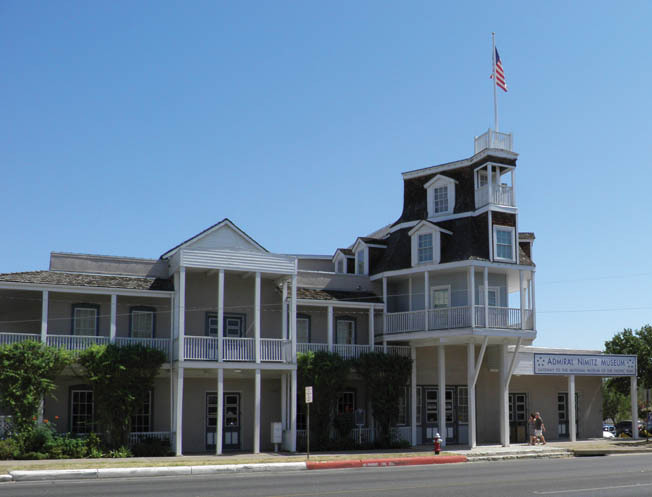 Exterior view of the Admiral Nimitz Museum (formerly a hotel) and a part of the National Museum of the Pacific War. Plan to spend several days in the Fredericksburg area (call the convention and visitor bureau’s toll-free number 1-888-997-3600 or see VisitFredericksburgTX.com. In addition to the museum, the Texas Hill Country area is akin to Taos or Santa Fe, with many art galleries, wineries, and distinctive architecture dating from the mid-1800s. A great place to stay to put you in the mood for the museum is the Hangar Hotel (hangarhotel.com), with its nostalgic 1940s decor, located at the Gillespie County Airport, three miles from the museum. What To Do With the USS Ling? Tags Admiral Chester A. Nimitz, Allies, atomic bomb, Axis, Japan, Japanese, Jimmy Doolittle, Kokoda, Nagasaki, New Guinea, Pacific Theater, Stuart tank, United States Marine Corps.